College Board said it will cancel the test scores of anyone found to be cheating and, in some cases, would bar students from retaking the test. In a statement to NBC News, College Board said that the organization has worked to "strike a balance between thwarting those seeking an unfair advantage and providing testing opportunities for the vast majority of students who play by the rules," but declined to comments on "specifics of question usage and test administration schedules." "In response to theft and organized cheating, which affects all of high stakes testing, we have significantly increased our test security efforts and resources," College Board said in a statement. 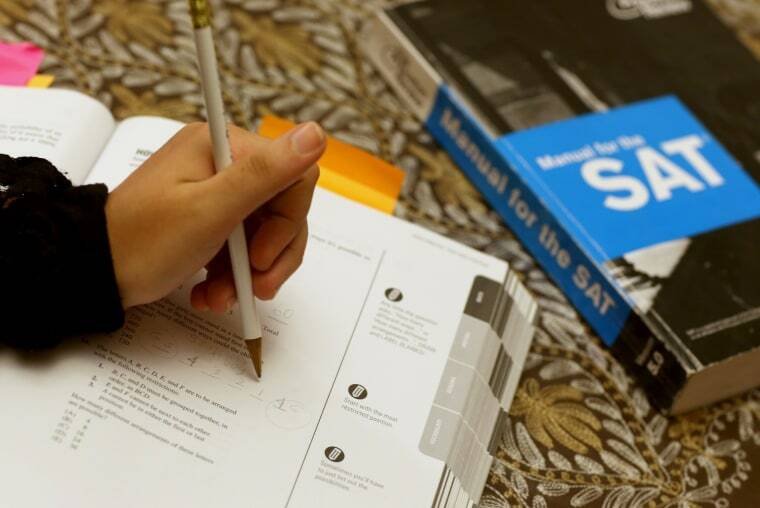 The statement was issued in response to some users on social media and texting apps claiming that questions on the August 2018 SAT were leaked early online, giving some students an unfair advantage. "Does Collegeboard know that their test book of August SAT is leaked already in China and South Korea way before the test start? Is this fair to the other students?," Twitter user Qufan Yang tweeted, along with an image of what appeared to be a test used outside North America. NBC News has not verified if the image is legitimate. Yang wrote to another user saying the test answers had circulated on an app called "WeChat." A now-disabled link posted on an SAT-related Reddit board on Sunday was labeled "answer key," with several replies asking the original poster to send them the cheat sheet. Others claimed the October 2017 SAT used in Asia was the same test used in North America this August, and that some students from China and South Korea had re-taken the test in the United States having already taken a similar test in their respective countries. NBC News was not able to verify whether or not early versions of the test had circulated online or had been administered in China or South Korea. NBC News was also unable to verify if anyone had cheated on the test. A petition to invalidate the test scores had nearly 2,000 signatures as of Tuesday afternoon. College Board said that it takes "quality control steps" to ensure cheating hasn't occurred, including a "comprehensive statistical analysis of certain test scores." "If we determine students have gained an unfair advantage, we will take appropriate actions, including cancelling test scores and, in some cases, prohibiting them from taking another College Board assessment," the statement said. "In order to protect the security of our tests, we cannot comment on the specifics of question usage and test administration schedules." On Twitter, College Board wrote that most scores on the tests taken on Saturday and Sunday would be available on Sept. 7, as planned, adding that "The vast majority of students follow our test security policies and our efforts are focused on finding those who did not."